Rare Steam Hunting Rare Machines in the deep south! Steam Rollers, Steam Trains and Steam Tractors from Argentina, selling all Steam Engines from Argentina, tarctors, old and vinatge, rare engines froun in this part of South America, Argentina, Chile and Uruguay,..... Argentina is a country whose communication system’s foundations have been layed down in rail systems’ blueprints. All through our history trains have been an indispensable factor, for production, leisure, communications and tourism. Firstly layed down for productive purposes, these rails have rapidly been also used to put our natural beauties in contact with those curious and adventurous travelers. And the result has been just awesome, because the possibilities of accesing some of this georgeous places are very much limmited because of the complex geography. Up in the northern part of our country, limmiting with Chile and Bolivia, there’s one of the worlds most beautiful places: the Quebrada de Humahuaca. Before colonial times, this area was a very important part of the Inca Empire, for it’s a one of a kind oasis in the middle of the arid puna, the Humahuaca valley is very fertile area surrounded by some of the highest mountains in South America, the Andes. Even during colonial times people in this places kept on working their lands as their forefathers did for many generations. Colonial authorities exploited other natural resources such as cole, silver and copper mines as well as sugar cane production. These two production systems still coexist to our days. The need of communications in times of the Independence brought the rail system to this area. The objective was to establish a fluent communication with Chile’s mine’s production. The result was the amazing Tren de las nubes, train of the clouds. This train was built in several stages between 1921 and 1948, by more than 3,000 workers. More than 500 km of rails open the path to an amazing journey through the clouds. La polvorilla is the last stop of the tour, running at more that 4000 mts of the sea level the train appears to ride on air as it crosses the viaduct of the same name. The journey is a lifetime experience and can be done all year long –although during winter there are some parts that are not available-. All ten couches are moved by the diesel locomotor. Comfort, a must in such an amazing experience, is also very taken care of, so that we, passengers can enjoy the ride without having to worry about anything. There are no words to describe this experience –believe me, I see myself as a very expressive person but that journey left me speechless… However the full smile on my face and the glowing in my eyes showed my inner happiness and astonishment in front of one of the most beautiful experiences ever. An other incredible train ride in our country is also in the northern area, but this time in the eastern part, in the border with Brazil. The rain forest train, tren de la selva, runs all the way through the National park of IguazÃº, to one of America’s greatest falls: the IguazÃº Falls. The beauty of this place, one of nature’s outstanding pictures, in the middle of the rain forest, this gigantic red watered falls (the ground in this area is reddish, very brick like because of its particular chemical composition) are just a beautiful spectacle available all year round, though in summer the temperature can easily reach the 45Â°C, all the rest of the year this area has a very warm weather. Nonetheless, the heat, the area is very well prepared to receive visitors from all over the world, therefore when visiting IguazÃº there are many outstanding accommodation options –all includded as well as spa resorts- that would make you feel very much at ease. Traveling south from Buenos Aires, there’s a must for all of those who want to travel through our Patagonia. Worldly known because of its cross path, short cut super economic: La trochita (short of Trocha which is Spanish for cross path). This 75 cm. cross path rail was began to construct in the early years of the 1920s, though its construction was delayed due to climate inconveniences. By 1936 it began to run through its amazing 402 km. This train had ups and downs regarding governmental policies, and it was closed many times. But thanks to the hard work of the authorities of the province of Chubut, the train is still alive and running, not through the original 402 km. But through 165km. Of beauty, through Esquel. LepÃ¡ and El MaitÃ©n. This train is not only a circulation service to witness amazing sights, but living history. The wagons in which we ride are the original 1922 ones, that are heated by antique salamanders regulated by the passengers to their preference. The whole train is an antique treasure that we have the pleasure to enjoy, even the locomotives, one of the two available is a Baldwin Locomotive Works, American, class 75 B with 431 hp of power; the German Henschel, class 75 H with 411 hp of power. There’s also a moanouver locomotive class 75 M, made by Henschel y Sohn. An other train treasure of the south is the historic steam train that rides in the sorrounding area of the Nahuel HuapÃ­ lake in the internationally renamed sky resort, Bariloche. Very much a rolling museum, this train was manufactured in Scotland in 1912 by the North British Locomotives company in Glasgow plaque number 121, the wagons were originally made in England, in an outstanding art deco style, made out of Cedar and Mahogany. All seats are covered in red and green velvet in the 667 wagon that was made in 1914. There are wagons that had been specially made for the important managers of some of this British trains and their family. The wagon booked for the family number 677 was specially made for them in England in 1913 and it has three bed rooms, kithcen, bathroom and a special room for the help that travelled along. Tourist class wagons number 128 was made in Glousester; the pine chasis was locally manufactured in 1914 by Ferrocarriles Entre RÃ­os, the wagon number 671 was a sleepling wagon owned by Ferrocarril del Oeste and it was specially made for them in Birmingham in 1914. The Dining cars number 5560 and 546 were made by the English brand Glousester and the chasis was fully made in Ceder and Mahogany. This specific information shows the class and confort offerd in this trains. AS to the ride, the sights are just incredibly beautiful, there are many stops so one can enjoy the amazing views and scenes. A perfect ride that combines the perfection and style of art and antique and the beauty of nature. The last stop in our train tour, and a must when visiting our Argentinean trains is the Tren del fin del Mundo, is the most southern rail system in the world, and one of the smaller cross paths. This the Ferrocarril Austral Fueguino was the first tourist train to be built in Latin America. This incredible amazing train runs through the same rails that the one who long ago carried prisoners to the maximum security prison in Ushuaia –now closed-. Far from the image of a prisoners train, this train is an outstanding and chick train, with all the top of the top commodities specially arranged for the passenger’s delight, specially with those rearanged big windows to enjoy the sights. As well as the two locomotives, diesel and steam, two true beauties. The station of the End of the world is located 8 km west from Ushuaia, that is the starting point of an amazing and ecological journey to the most southern train station in the world in the National Park of Tierra del fuego. The journey is beautiful, the sights, the places, nature’s treasures are exhibited in all their greatness. Just before arriving to our last stop, the curve the train takes opens up into thick woods cohiues and lengas, local millenary trees. There is no better ending to a wonderful and amazing trip. The origin of Lanz tractors can be traced to the early 1920s. These German tractors were made in the plant in Manheim in Germany until approximately 1960, where the majority of the models had single cylinder, horizontal, two-stroke engines. LANZ In Germany, Lanz produced Bulldog tractors including the Model T crawler and the L, N and P wheeled models offering 15, 23 and 45bhp respectively. Back in the early days, Lanz was synonym of efficiency and low cost strong machines. This made them special within the international market for it was the best ally to start off agricultural businesses. This unique feature made of Lanz tractors a world wide trademark, exporting their models in and around the globe. Lanz came to Argentina through means of importing the finished product the same way they did in other Latin American countries such as Uruguay, Brazil, etc. These greatly appreciated tractors had bee manufactured at Mannheim Germany from the mid 1930's until the Second World War. At that point more than 100,000 Bulldog tractors had been produced when the factory was virtually destroyed by bombing in the early part of the Second World War. After a struggle to re-establish production after the war it was the late 1940's before the 06 series of tractors reappeared in 1956 John Deere took over the company and the old Lanz factory is now their European manufacturing base. 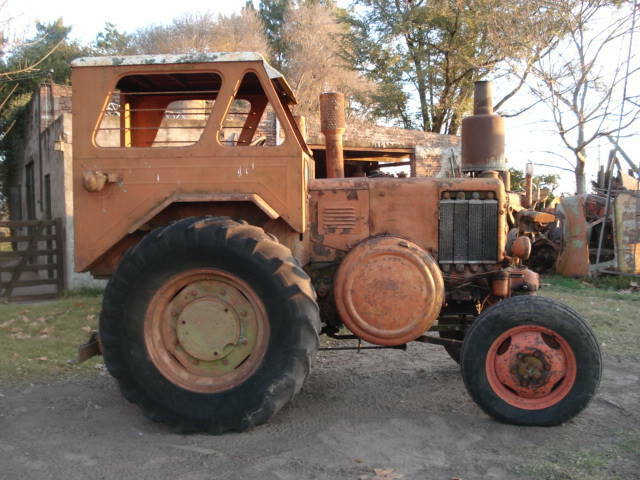 The history of Lanz tractors in Argentina is all in all richer, for these famous German Field machines were the base inspiration for Argentina’s single most interesting made Tractor: PAMPA. Made during the second presidency of Juan Domingo Peron, the State Industry Company IAME, altered the German Bulldog Lanz to make it the Argentine way. The traditional blue color in these tractors was changed for a bright orange. Changing the type of gas supply which in Germany was Diesel oil for a cheaper fuel available in Argentina which was a mix of kerosene and used oil or even animal fat, the Pampa was a really inexpensive productive tractor. There were only 3500 Pampa tractors made in Argentina. All the Tractors of the World! Its common knowledge that Argentina is one of the world’s most rich grain and meat producers. Thanks to the excellent natural capabilities of our soils and our extensive Pampas, this country has always advocated to this production area. Therefore all kinds of rural technological inputs have always been very welcome. Early in 1900, the rural producers of our country gathered together to create an institution that represented their interests, that’s how the Sociedad Rural Argentina came to life. Ever since, then, they’ve gathered together at least once a year to discuss the situation of the Argentine field, perspectives of evolution and progress and of course, discuss the latest technological innovations that could improve their production. Such is the importance of this annual reunion that it gradually become to be an open meeting, evolving to our days to be one big social event and show of our field. Later on, by mid 20s the Argentine field had evolved into not only being managed by big rural entrepreneurs, but also small and medium farmers who owned what’s known in Spanish as Chacras. Although apparently the same, these producers had different needs regarding their fields that apart them from the Sociedad Rural Argentina. The difference in the extension of the field demanded different technological appliances that could adapt and result in a much better combination of capital inversion and productiveness. These small and medium productors also gather yearly to discuss the evolution in their area at Expo Chacra. Non of these shows are exclusive, meaning that the direction that has resulted from their evolution makes them more and more compatible and a gathering point to discuss the Argentine field’s interests. Nowadays, there are many other exhibitions and shows regarding our rural industry. Among the most important ones in the grain production is feriagro, specially devoted to agriculture. Today all year round one can assist to any of these international level shows to find out what’s new in the area. But, for these are somewhat yearly homages to the most important industry of our country, these are museum like shows, were the latest technological innovation is put in perspective regarding the evolution of the industry. The most common living history is in the tractor field, these coveted objects –not only for their actual use but for their importance as collectibles- are proudly presented by their owners. Its become a must now, that worldly collectors assist to these meetings showing their treasures, at the same time they establish contact with other fellow collectors. An other interesting turn in these shows has been the revalue of toys. It’s a deep belief that toys are somewhat scale representations of reality, and in a rural country such as Argentina, there has always been a proliferation of rural or farm toys. All and all they had mostly been presented to society at these shows. For the publicity is unsurpassed and the incredible flow of public that attends is just immense, so many toy stands were side by side the real life model… This had inspired on and on companies to launch together with their products, toys that represented them. They thought “Dad and son both have the same item, adjusted to each ones’ needs”. So, vintage toys and vintage tractors or farm implements are exhibited side by side the latest technological innovations. For those farm lovers, this is a must, for this is one of Latin American most important rural industries reunions, for those who work in the fields and for those who treasure men’s production in this area throughout time. .............. The Buenos Aires Toy Museum, el Museo del Juguete Argentino. El Primer Museo Argentina en la web desde 1996. Tambien te podes hacerte Fan y sequier las novedades, aqui en Face Book, buscanos estamos con el nombre, The Buenos AIres Toy Museum. Información sobre Arte y Antiguedades en la Argentina, Saludos hoy desde Buenos Aires, Roberto ( Bob ) Frassinetti. Travelling Argentina for Old Iron, Steam Engines and old Tractors.